This is the story of how I saved an ugly cookie. Actually, let me re-phrase that… how I saved a disgustingly ugly-looking cookie that was totally worthy of eating but not appropriate for sharing with anyone, let alone on the blog. I decided to share them anyway because they have a funny story behind them, they ended up with a happy ending, and they were darn good too! 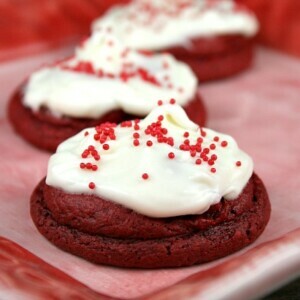 Here are my Red Velvet Cookies with Cream Cheese Frosting. 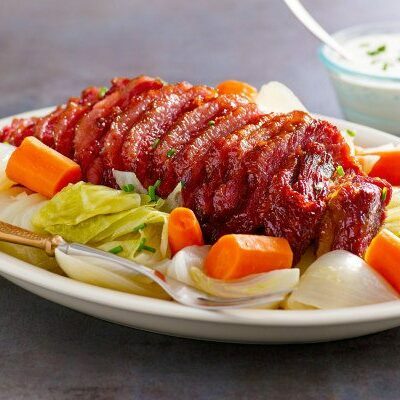 I’m not sure how I found this recipe, but it was randomly tucked into the comments of another recipe on the internet that I happened to be looking at. I used that base recipe to create these. This cookie dough begins with a red velvet cake mix, and the batter is super duper thick. 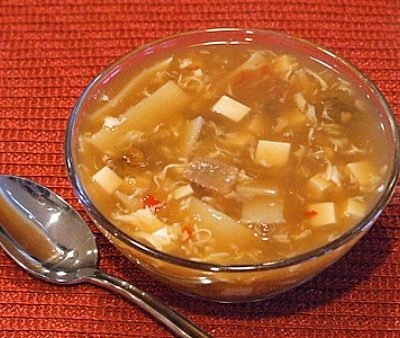 It’s so thick that I’m just gonna warn you right now that you’d better use a strong wooden spoon to stir it all up. 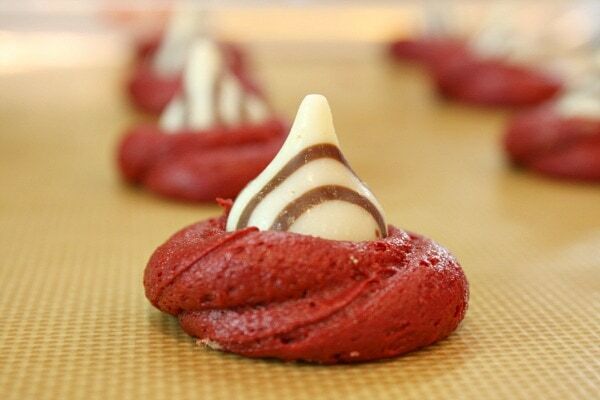 I stuck a Hershey’s Hug Kiss in the center of each red velvet cookie dough blob. And then squeezed some more cookie dough on top to sandwich it all together. Here’s the part where I pretty much fell on the floor sort of laughing and crying. What do those look like to you?? 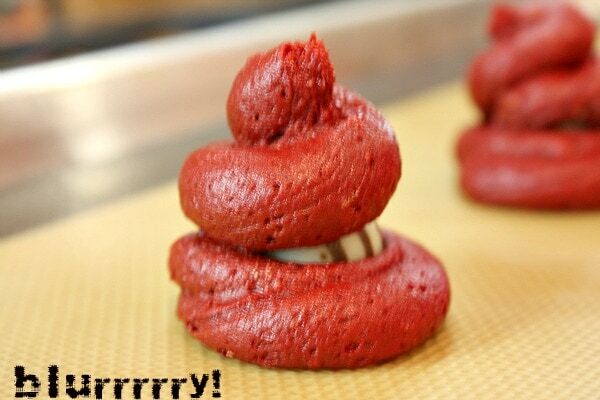 Little piles of red velvet cow poop, right? 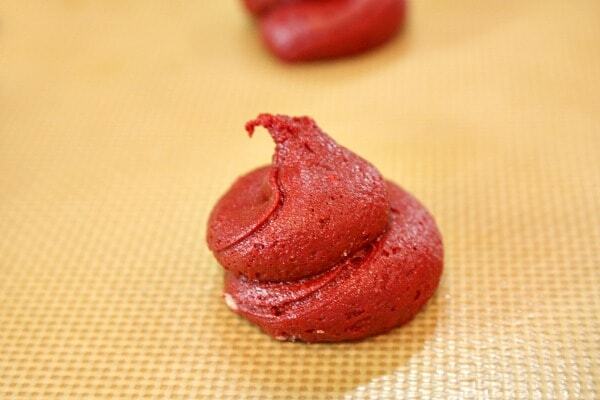 Yep, I made red velvet cow poop cookies. NICE. The funny thing is that they were really delicious! They were not super cakey- just kind of like a regular cookie but a little soft- and then had that wonderful bite of chocolate in the middle. After sharing my red velvet cow poop cookie photo with my Instagram (find me there as RecipeGirl) friends, they suggested I rescue the cookies with a swirl of cream cheese frosting. So I did. All better. Unless some unsuspecting individual licked the frosting off of the cookie, no one would have a clue what they once looked like. They actually turned out kind of pretty after all! 2. Whisk together the dry ingredients in a large bowl. 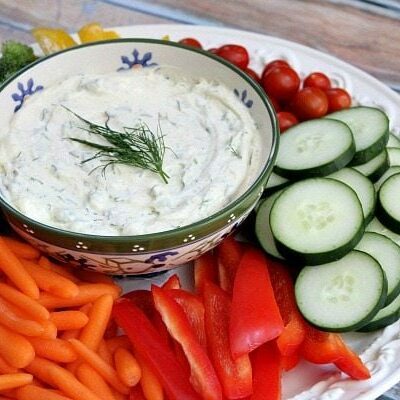 In a separate bowl, mix 4 egg whites and sour cream, then use a WOODEN SPOON to mix it into the dry mixture. The mixture will be very thick. Add an additional egg white if it's impossible to stir. A thick batter is what you're looking for though. You'll think it's way too thick (I did. I thought... there is no way this is going to work out!) but it does work out and bakes up into a tender cookie. 3. Use a small cookie scoop or a spoon to drop a tablespoon of cookie dough onto the prepared baking sheet. Press a kiss into the cookie dough, and then top the kiss with another tablespoon of dough. Just kind of plop it on top... it will bake together in the oven and keep the Kiss inside. Repeat with the remaining cookie dough. Bake 12 to 13 minutes, until the cookies are set. Remove from the oven and let cool on the cookie sheet a few minutes before transferring to a wire rack to cool completely. 4. If you'd like to frost them, you should do so just before serving them. Use your favorite frosting recipe, use a canned frosting (for ease) or use my quick recipe. 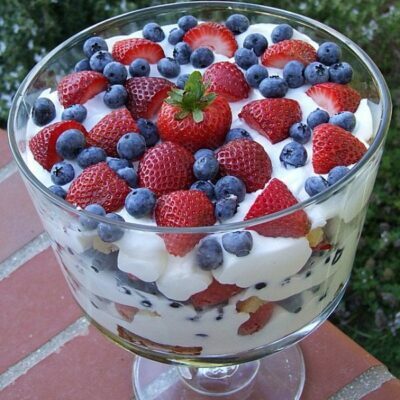 Just use a hand mixer to combine the cream cheese with 1 1/4 cups powdered sugar and drizzle in enough whipping cream or milk to create a nice spreading consistency, adding more powdered sugar if needed. Spread the frosting on the cookies. Top with decorative sprinkles, if desired. 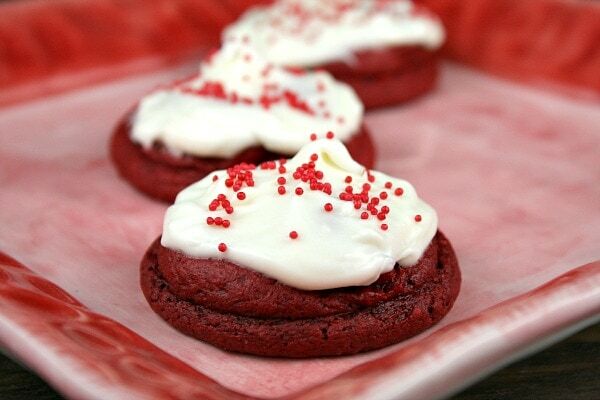 *If topped with the homemade cream cheese frosting, the cookies will need to be kept in the refrigerator in a covered container. Bring to room temperature when ready to serve or nibble. I made these this afternoon and was disappointed. The dough was a bear to work with. After baking, the bottoms fell out where the melted kiss had settled when I tried to remove them from the baking sheet. And after all that, the taste wasn’t really that great. I won’t be making them again. Definitely trying these within the next week. 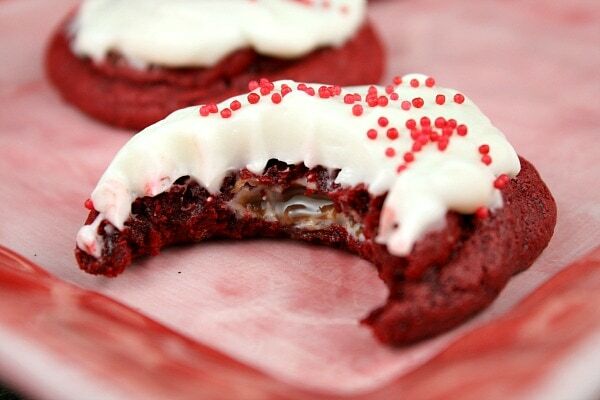 My boyfriend mentioned how much he loves red velvet cookies when we first started going out. I’m surprising him with these. I’ve been looking around for different recipes, and couldn’t find anything besides just the basic cake mix. I’m so incredibly glad I found this so I can do something different. Thanks for sharing! I am definitely going to try these out for the fire department fundraiser we are holding in a couple weeks. I’ll do a test batch this weekend and go from there. Just so you know I’m so glad they turned out looking like cow patties, I think everyone will get a kick out of them if I leave the topping off, and it will really help bring some donations to a great cause. We live in Texas so what’s better than cow patty cookies? Just made these. Cookies are cooling and in the meantime I made the icing. YUM! Can’t wait to try. This is a test bake for me as I will be using these for my company bake off on May 7th! These sound and look absolutely delicious!! I actually probably would’ve enjoyed their original shape since my friends and I are strangely amused by cow-poop shaped things… Since my spring break is coming up soon, I’ll probably try making these and sharing them with my family and my friends who are also home for break! The kiss in the middle seems like the perfect little surprise. I think I’ll try some with cream cheese frosting and some without. 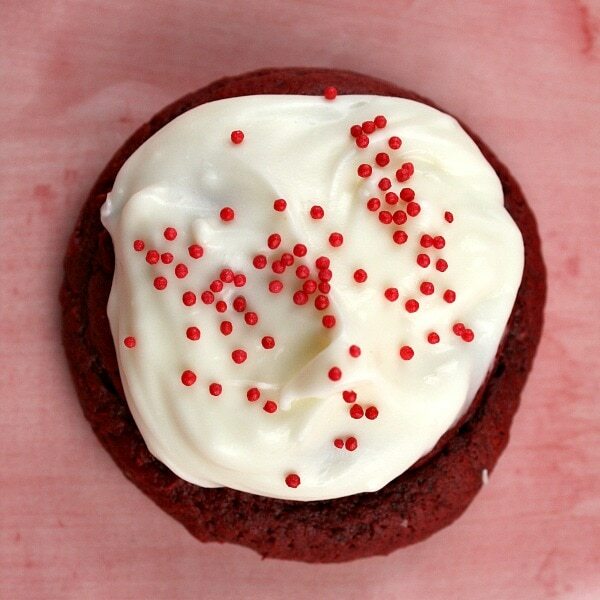 As someone else said, you can’t go wrong with cream cheese when it comes to red velvet! These look deeee-vine!! LOVE them. HaHaHa! ~ This made me laugh so hard! Thanks for sharing this experience with us! It’s a good thing you weren’t using chocolate cake batter! Ha ha ha!! ROFL! I laughed so loud and long, the cat came in and is meowing at me. (I can’t laugh in this house without the cat saying something about it.) I would totally make these as cow plop cookies for the kiddos, except that the frosting just takes them over the top. Yummage! i really love everything about these cookies! Especially the surprise inside 🙂 So gorgeous…i have an obsession with non-pareils! Happy V-Day! I modified these slightly by leaving out the hershey kiss and making these like whoopie pies. I did add a little veg oil to the batter as it was still really thick after 5 egg whites. I used a 1 inch scoop, flattened them out a little and cooked for 10 minutes. I had been wanting to make whoopies pies for a long time and this made it really easy. They turned out so delicous and moist! Thanks for the recipe! I loved your story. Laughter is a good way to start my day. Thanks! 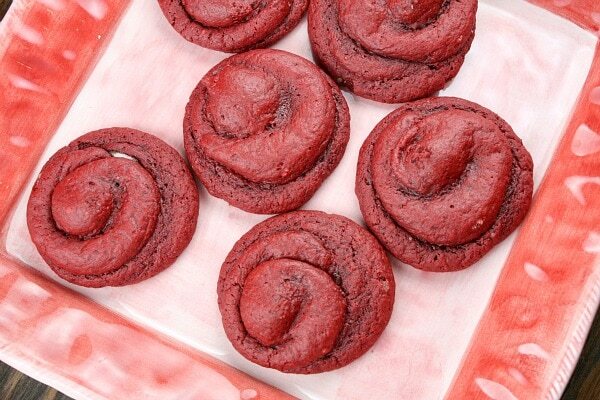 LOL Red velvet POOP cookies….LOL Thanks I really needed a good laugh tonite. Kinda reminds me when I was a kid + mud pies + green food coloring. 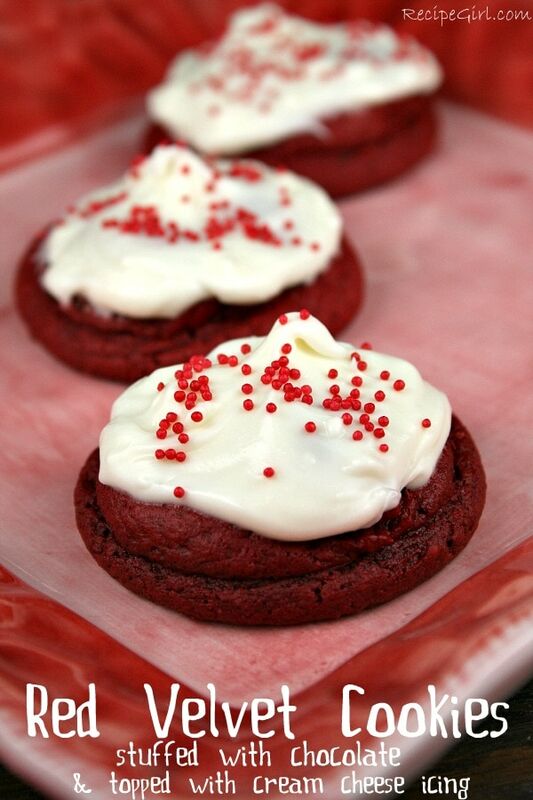 So, anyway so very happy you added the frosting…they really do look yummy….funny…but yummy. Oh my, I need to try these! Everything you make looks absolutely heavenly! After seeing your tweets about the disappointment, I’m happy to see you rescued your forlorn little red cherubs. Love the chocolate sneak attack and that last photo of your perfect bite will make your teenage orthodontist proud. Love the story ‘behind’ the cookie!!!!! Teehee! I’d love to make them with milk chocolate Kisses. Thanks for the laugh as well as the recipe! Love it! Hilarious, but what an amazing save! I am sure they are delicious with the kiss in the center too!